Has been promoted to the newly created role of executive vice president of product and customer experience from her previous role as chief product officer. The former chief executive officer of Jiff until Castlight acquired the company more than a year ago, has stepped down from his roles as director and president. Newell will remain an advisor to chief executive officer John Doyle through September 30, 2018. Today, the company is also reiterating the full-year 2018 guidance it provided on May 10, 2018 as part of its financial results press release for the first quarter ended March 31, 2018. Verhave retired in April 2018 from BNY Mellon after ten years as executive vice president, global head of compensation and benefits, where she was responsible for the design and delivery of compensation, benefits, and wellbeing for the company’s 50,000 person global workforce. From 1989 to 2008, she held a number of human resources leadership positions at Fidelity Investments, including the role of executive vice president, global head of compensation and benefits from 2003 to 2008. Verhave currently serves as the chairwoman of the board for the National Business Group on Health, a non-profit association of more than 420 large, U.S. employers that provide health coverage for more than 50 million U.S. workers, retirees, and their families. O’Meara joined Castlight Health in 2010 and is responsible for leading Castlight’s product management, design, analytics, and customer experience teams. With close to eight years of experience at Castlight, she has held leadership roles in business development and product management, including leading the design, strategy and development of the predictive analytics engine that personalizes Castlight’s current health navigation packages. 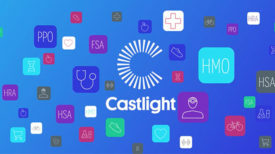 Most recently, O’Meara led the design and delivery of Anthem Engage, Castlight’s first combined wellbeing and care guidance offering. Prior to Castlight, O’Meara worked in venture capital with a focus on healthcare and consumer technology at Highland Capital Partners. She began her career at Bain & Company with a focus on provider, pharmaceutical, and consumer products strategy. O’Meara holds an MBA from Stanford Graduate School of Business and a BA from the University of Virginia.